Elena Duggar is the Chair of Moody's Macroeconomic Board, which is charged with developing the macroeconomic forecasts for use in the rating process throughout the rating agency. 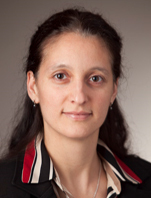 Elena also manages the Research team in the Credit Strategy and Research group, which authors Moody's global macroeconomic outlooks, along with thematic research on macro and financial risk topics. Prior to assuming her current assignment, Elena served as Moody's Group Credit Officer for Sovereign Risk, covering the global sovereign ratings portfolio. Elena also served as a voting member of the company's Public Sector Credit Committee and Public Finance Franchise Committee, responsible for reviewing and approving sovereign and public sector rating methodologies. Elena is a globally-recognized expert on sovereign defaults and the author of a large number of Moody's publications, including Moody's Global Macroeconomic Outlook, Moody's Sovereign Defaults Series, Moody's country ceilings methodology and default studies for the sovereign, sub-sovereign, and emerging market corporate sectors. Her research work is frequently cited in the Wall Street Journal, the Financial Times, Bloomberg, Reuters and leading financial media. Elena joined Moody's in 2007 and previously was an Economist at the International Monetary Fund, where she analyzed financial system stability in the Monetary and Capital Markets Department among other things. She holds a B.A. in Economics from Bates College and a Ph.D. in Economics from the University of California at Berkeley.